I don't understand why we have to mix a certain class of assets with politics. After all, talk is cheap. To you, property is seen as an asset class. But to some, it is seen as a home for the family. Democratic gov is elected to help the people run the country & manage it's resources so that the people's life will get better. Combining the 2, home prices become political. Solution: Raise interest rates substantially and prevent cheap money from flooding the market. The most effective way to curb inflation but they will say it is going to hurt the economy and of course their profits and self interest. It is made political by people: self interest + greed. Consumers on the other hand wants the best and pay the less. If you don't mind a home for the family at seberang prai or bukit mertajam, it is all within the affordability range. At the end of the day it is all about profits. "......Non-local and corporate buyers will have to pay a 15 percent tax upon purchase, Financial Secretary John Tsang told reporters at a press conference on Oct. 26. 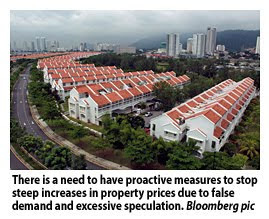 The government also raised a resale tax on property by about 5 percentage points and extended the period during which it will apply to three years from two....."...Another round of anti-speculation measures targeted at foreign buyers introduced by Hong Kong.